A lot of manufacturers like to bundle just the bare necessities with their products so it's always a bit of a treat to test out a top of the line model that comes with literally everything in the box. There are different flavours of the 875P Neo which are designed to fit different requirements and budgets, but the -FIS2R version is like getting A/C, leather, CD, and mag wheels with that new car. Heck, we're even geeky enough to get a little excited about that "new motherboard smell" that wafts out of the box once the anti-static bag is cracked open. 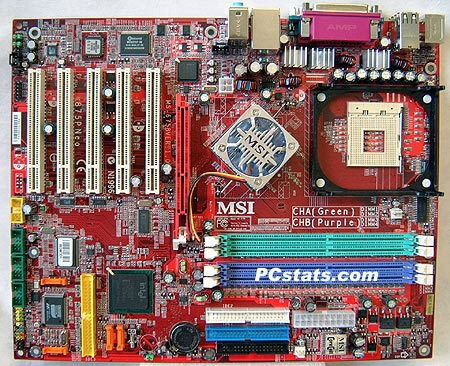 This bright red ATX board is currently MSI's flagship model on the i875P Canterwood chipset. It commands a bit of a premium in terms of price, retailing for $245 CDN ($185 US) or thereabouts. With the release of the 875P Neo and 865PE Neo2 motherboards, Canterwood and Springdale-based respectively, MSI is now also targeting the overclocking market head on. The question as we see it is whether or not MSI can provide the gear necessary to convert die hard overclockers who usually have a lot of brand loyalty (ie. Asus, Abit, Epox). Converting these folks who are admittedly obsessed with speed, is not necessarily going to net a company a hudge influx of sales either. After all lets face the facts, overclockers are generally considered to represent only a very small portion of the entire mainboard consumer markets. What is more significant is that overclockers and die hard enthusiasts typically set the trends that mainstream consumers follow. For the enthusiasts out there reading this, just try and count how many motherboards you've recommended in the past year to people - I'll bet it's quite a few! Of course there is a lot more to a good motherboard than simply how well it overclocks. As you'll see in the next few pages of this review, the MSI 875P Neo-FIS2R is also one well rounded mainboard. Starting from the beginning, we find 5.1 audio, three IEEE 1394 ports, Serial ATA/Serial ATA RAID, an additional Ultra/133 channel and Intel Gigabit CSA LAN among other features. Colourful isn't she? The layout of the MSI 875P Neo-FIS2R is excellent; with nothing major that will get in the way of anything else. The 875P Neo also includes a small mountain of cables, connectors, and brackets to take advantage of all the "goodies" which are onboard. 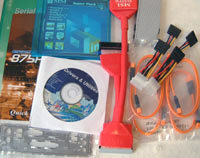 For example, we find four convict-orange Serial ATA cables, two Molex-to-Serial ATA posthumously power connectors, a rounded IDE cable and a pretty extensive software package which actually includes..... useful software! The motherboard supports 533/800 MHz FSB based Northwood Pentium 4 processors and the four DIMM's will accept up to 4GB of PC1600/2100/2700/3200 DDR SDRAM. The board runs best with a dual channel DDR configuration (two similar sticks in the light or dark blue DIMM sockets), but is flexible to run on just one DIMM if that is all you have on hand. 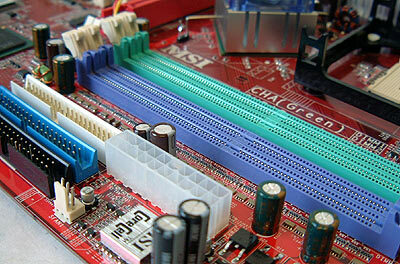 Rounding out the integrated features we find five 32-bit PCI slots for future upgradability as well as a 8x AGP socket.